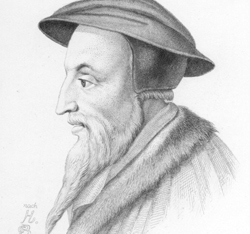 Calvinism: Is It Changing The World? A colleague directed my attention to an online TIME article which identifies “10 Ideas Changing The World Right Now“. Interestingly, #3 on that list is “The New Calvinism“. The article seems to be predominantly tagging Reformed Baptists (John Piper and Albert Mohler are named) and noting their influence within the United States. I was sorry to see the only Presbyterian reference in the article received a “liberal” tag (Presbyterian Church U.S.A.). From my limited standpoint, I would argue that R.C. Sproul (Presbyterian Church of America) has raised the profile of Calvinism/reformed theology more than any other individual in my lifetime. This brief read is worth the time (no pun intended!). Would love to hear you chime in on this in the comments section. This entry was posted in Promoting Christ, Reformation History by Bryn. Bookmark the permalink.